Diamond USA Inc. is recalling packages of Dry Apricot Rolled because they contain undeclared sulfites. People who have severe sensitivities to sulfites run the risk of serious or life-threatening allergic reaction if they consume this product. The consumption of 10 milligrams of sulfites per serving has been reported to elicit severe reactions in some asthmatics. Anaphylactic shock could occur in certain sulfite sensitive individuals upon ingesting 10 milligrams or more of sulfites. Analysis of the product revealed it contained 53.24 milligrams per serving. 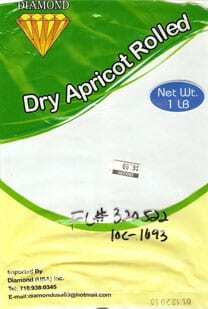 The U.S. Food and Drug Administration reports that the recalled Dry Apricot Rolled was distributed in New York, New Jersey, Virginia, and California to retail stores. The product comes in a 1 lb sealed package with code #01-12-2010. It is a product of Afghanistan. No illnesses have been reported to date in connection with this problem. Consumers who purchased “Dry Apricot Rolled” may contact the company at (718) 938-0345.